If one District of Columbia official has her way, the city’s wildly popular food trucks could find a place on the National Mall. Harriet Tregoning, D.C.’s Director of Planning, wants the National Park Service to make changes to its regulations to allow food trucks to park and serve customers near the Mall. “I would encourage them…to give visitors more variety and more flexibility,” said Tregoning. It’s currently slim pickings on the National Mall. One can either hit up a museum or a hot dog stand. Tregoning is proposing having an entire pavilion of food trucks lined up on Seventh Street during lunchtime hours to give visitors a choice. 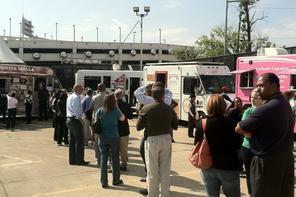 For many people, food trucks are part of a daily routine. But for some vendors who serve nearly 300 customers a day in downtown D.C., they are not so sure there will be a consistent client base at the Mall. Current National Park Service regulations prohibit financial transactions on Park Service property. So far, they were not shooting down the concept, but it was not immediately known when a decision would be made.